Exploring in the dark - Super Inky! Tonight I went exploring in the dark! In only a few more weeks, I will get to go to the Grand Canyon. We'll probably camp there, so I wanted to make sure I was ready to scurry through the dark to the bathroom cabin! 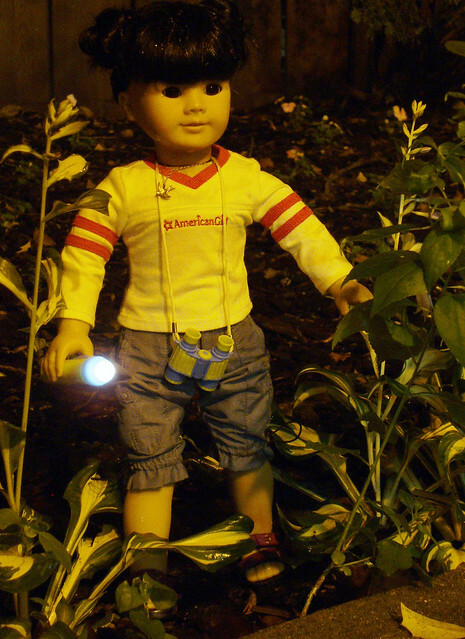 I played in the bushes downstairs by the front of our building; it's not safe to go into the park at night in the city. You never know who could be lurking there. Actually, Violet's mama will probably walk with us to the bathrooms, but it's good to be prepared just in case. A flashlight is good to have, but sometimes the moon and stars are so bright I can see really well at night! I still have to go with Tía, though.